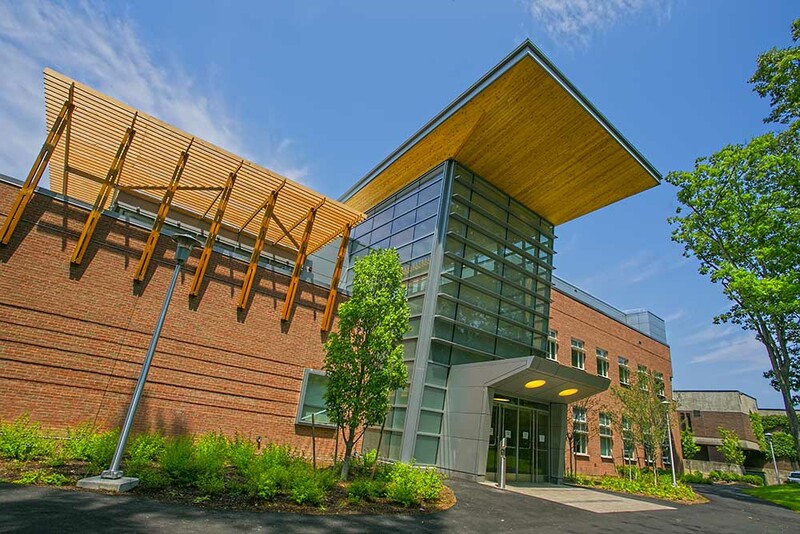 The new home for the Department of Computer Science (CS) at Stony Brook University officially opened July 1, 2015 and close to 100 staff and faculty quickly moved in. Its official ribbon cutting ceremony celebrating the opening of the new 70,000 sq ft building was held on July 1. Senator Ken LaValle and other elected officials, industry partners, faculty, staff, students, and alumni will also be on hand at the ribbon cutting where they will tour the new facility and meet with researchers. At the first faculty meeting held in the new building on June 12, Arie Kaufman, Distinguished Professor and Chair of the CS department, thanked everyone for their patience throughout the process and he thanked the systems staff, led by Ken Gladky, for tirelessly working to get the building ready for this “happy moment”. With over 14,000 sq ft of research lab space, the three-story building will house 60+ faculty and post-doc offices. It has both faculty and graduate student lounges, breakout space for collaboration including two outdoor areas, five conference rooms with integrated video conferencing, two state-of-the-art teaching labs with MOOC and distance learning capabilities, and undergraduate and graduate student practice lab and workspace. The new CS building also includes five innovative centers for research: National Security Institute (NSI), Center for Mobile Computing, Center for Dynamic Data Analytics (CDDA), Center for Smart Energy, and the Center for Visual Computing (CVC). The A/E/C team, which includes Mitchel Giurgola Architects and URS, started construction on the new building in September 2012. To ease transition, moving in to the building was done in three-phases with all faculty and staff completely moved in by August 2015. The Old Computer Science building will continue to house a few of the department’s key labs including the Multimedia Lab. The new facility that will accelerate Stony Brook University's growth as a leader in computer science education and research. Established in 1969, the Department of Computer Science at Stony Brook University is consistently ranked among the top research computer science departments in the nation and is the largest unit in the College of Engineering and Applied Sciences. As technology significantly impacts all aspects of our lives and plays a key role in every research discipline, the Department of Computer Science is poised for nationwide, interdisciplinary collaboration. Internationally renowned faculty who have made significant contributions in the research areas of visual computing, computer systems, networking, cyber-security, algorithms, and intelligent computing are excited for the opportunity to work in the new state-of-the-art facility. The new facility complements existing technology and research space at the Center of Excellence in Wireless and Information Technology (CEWIT), a $50 million high-tech center with 100,000 sq ft of applied IT research labs. To see updated images of the new computer science building during construction, follow us on Twitter or like us on Facebook.